Become part of your favorite cartoon by wearing this adult Duffman Costume! 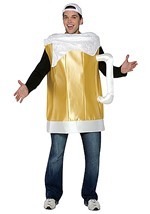 The mens costume includes a jumpsuit that velcros in the back. 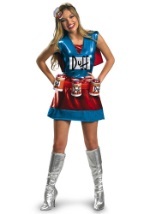 The main portion of the costume is blue, the waist area is red, and the arms and around the neck are flesh colored. The chest and upper arms are padded to give a muscular appearance and a white square that reads "Duff" decorates the chest. The red cape attaches to the shoulder with velcro. The red hat reads "duff" and is made of polyfoam. 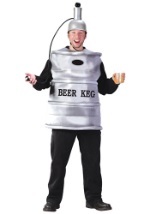 The belt attaches around the waist with velcro and has four beverage holders that look like Duff beer cans. 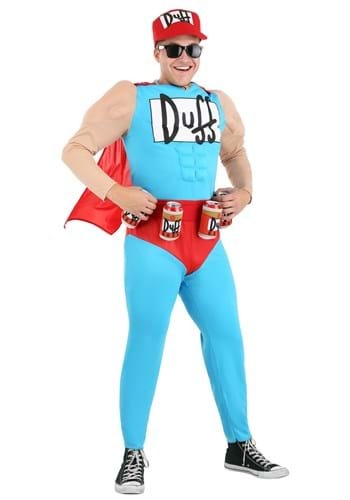 Get together with our Duffwoman costume for a couples costume idea from the Simpsons!